Let's Be Frozen [E1527] - $6.00 : Yarn Tree, Your wholesale source for cross stitch supplies. Cross stitch chart from Imaginating. Designed by Ursula Michael. 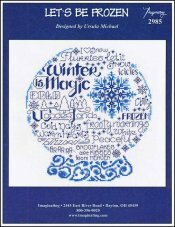 A snow globe filled with snowflakes and winter themed words. Stitch count 112 x 127. Stitched on 14ct Aida white.